Instead of just having a recipe idea, I actually now have an exact recipe of how to make my soy curl dish. How are soy curls made? 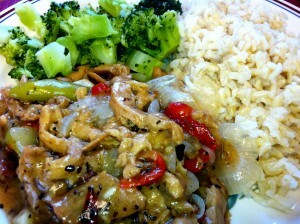 I believe soy curls is an excellent meat substitute that can absorb the flavor of the dish that you make. NEWSTART Teens founder, Gerrod Clarke, makes an excellent barbecue soy curl dish that I’ve tried recently. Where can you buy soy curls? This soy curl dish is a winner. I’ve prepared it for a vegan cafeteria, and I’ve taken it to church potlucks several times using the recipe idea I shared last year, and I’ve taken it to a church potluck using this specific recipe. It’s been a winner every time! Boil 2 ½ cups of water. Turn off the heat, and then place the 6-7 c. of soy curls in the pot. Allow the soy curls to absorb the water, and then drain out the excess water. Season them with ½ tsp. garlic power, 1 ½ tsp. onion powder, ½ tsp. thyme, 1 tsp. Italian seasoning, and 1 ½ tsp. of salt. Place them on a sprayed pan and place in oven on 350 for 30 minutes. While that is in the oven you can wash ou the same pot and make a semi sweet mixture. Place 2 cups of water in a pot with 2 ½ tbs. of cornstarch mixed with a little bit of water. Then boil the water, whisking constantly. Reduce the heat to simmering and place in the pot 1 bell pepper cut long ways, ½ of a medium sized onion diced, 1 c. of baby carrots , ½ tsp. salt, 1 tsp. Italian seasoning, ¼ tsp. thyme, ½ tsp. coriander, and 1/8 c. honey. If you don’t have baby carrots, then cut your carrots long ways to the length of baby carrots. Allow the pot to cook down the peppers, onions, and carrots. After 30 minutes, places the soy curls in the semi-sweet mixture. If the vegetables and onions are not cooked down in time, place everything in a pyrex dish covered with aluminum foil for 20 minutes or so until at 350F until they are cooked down a little bit. This dish served five people that also ate a salad, frozen vegetable (warmed up of course) dish, and 2 cups of rice with 6 cups of water and one tsp. of salt placed in a pyrex dish covered with aluminum foil and baked at 350F for 2 hours. ****If you don’t use honey, you can use a sweetener of your choice.